All photos by Jake Emen.ANXO Cidery & Pintxos Bar (that's AHN-cho and PEEN-chos) made its highly anticipated debut in Washington, D.C., this summer, becoming the city's first cidery and cider-focused bar. Basque cider and cuisine is the name of the game, and there are several dozen ciders available on tap by the glass, organized into four flavor categories. Additionally, there's a lengthier list of bottles which can be enjoyed there or are available to purchase and take home. Ciders by the bottle are broken down by country and region, however, each also has a note for which of the bar's flavor categories it falls into. The Basque region takes center stage, but cider from all places are welcomed, as long as the apple is the star of that show. "We decided to take a somewhat strong stance on adjuncts in cider, like adding fruit, ginger, stuff like that," explains beverage director Tim Prendergast. "There's a lot of those ciders out there and it's driving a lot of the growth and interest in cider right now, but we made a conscious decision not to include those," he continues. "We want to highlight the apple. The best wine in the world isn't made with blueberries and grapes, it's made with the best grapes. And the best cider in the world is made with the best apples." D.C. is educating its drinkers more than ever before, offering world-class tutorials on everything from mezcal at Espita Mezcaleria, to PhD-precision cocktails at Columbia Room, and now cider, at ANXO. Would this have been able to work in this town, even two years ago? "I don't know, probably the reaction would have been a little bit different," says Prendergast. Still, the city's drinkers have risen to the challenge. "People are way more adventurous than I thought," he admits. "I had some cider that was a little bit maybe more accessible, more along the lines of industrial ciders. I had one or two of those on the menu on the sweeter side... and I thought people were going to be clamoring for that, and they really weren't. There wasn't much interest and I don't have to carry it anymore. It's awesome." Not only has he been able to weed out those entry-level ciders, but the rest of the drinks lineup is largely overlooked. "Honestly, people drink so much cider here," says Prendergast. "They drink way more cider than I thought. We thought we were going to have a good amount of cider drinkers but also people that drank a lot of beer, and cocktails, and wine. But we just destroy cider. We sell some wine, and we sell some beer, but not really." ANXO also offers several sherries by the glass, along with two vermouths on tap, showcased along with more options by the glass during a weekend afternoon vermouth hour which is starting to prove popular. But people come for the cider. As for that cider, the list if broken down into four flavor categories: Structured, which are often earthy and tannic, Bright, showcasing acid, Fruit Forward, and Rustic, a bit of a catch all for remaining tart ciders. After watching things in action though, Prendergast believes he can go onto segment things more effectively. "Now about six or seven weeks into the restaurant, I think there are some ciders that don't quite neatly fit into those four categories, it probably needs a 5th category," he says. "The Structured section is something that should be more like Balanced. They have some earthiness to them, but are more balanced between acid and tannin and sugar. But there needs to be a category for very tannic ciders, very dry, earth-tannic ciders." ANXO has already collaborated with two cideries for private releases available at the bar, Maryland's MillStone Cellars, and Vermont's Eden Specialty Ciders. "The collaboration #1 and #2 are very indicative of the MillStone style," says Prendergast. "And that's very non-interventionist, it's no sulfites added, a lot of the times they don't add yeast at all. They don't do any temperature control, so there's a lot of acetic acid to it, a lot of volatile acidity, and that's a lot of that tart flavor profile that you're getting." Working with MillStone was an easy decision after the team became acquainted with them several years prior while working at a popular D.C. beer bar. "My partner Sam [Fitz] and I and Cooper [Sheehan] all worked at Meridian Pint for awhile," says Prendergast. "And we starting buying their cider years ago, when they first opened. We were really into sour beer at the time, and their cider was very much in that vein. And that was kind of what turned us onto cider. So we've been up there and visited, even when we were just people in the beer industry, and just developed that relationship over time." Their #1 and #2 collaborations were produced in 660-gallon batches, while their collaboration with Eden resulted in a 1,000 gallon batch. Half of that was kegged and is served as their #4 collaboration, and the rest was split into two batches, half as bottled still cider, and half as bottle-conditioned cider, the latter of which will soon be available in D.C. Whole Foods stores. More collaborations are on the way, too. "We're going to travel out to England and do a collaboration there in the fall," says Prendergast. "We're probably going to do another one with MillStone. We may do another one with Eden. I'd love to do one with Titled Shed out in California, we're in talks to do that." They aren't stopping there though. A production facility with its own tap room is on the way, located just a few miles away from the bar. "Our goal this year is to make a moderate amount of cider on our own," says Prendergast. "We're starting our first vintage, and we probably have 100 pounds [of apples] in the walk-in downstairs right now that we're going to press. "We're sourcing some apples in Virginia, from some really good orchards, like Diane Flynt at Foggy Ridge, we're talking about getting apples from her. "So we're going to start getting into that," he continues. "We'll press here and at our other facility that we're building out, which by November will be online." 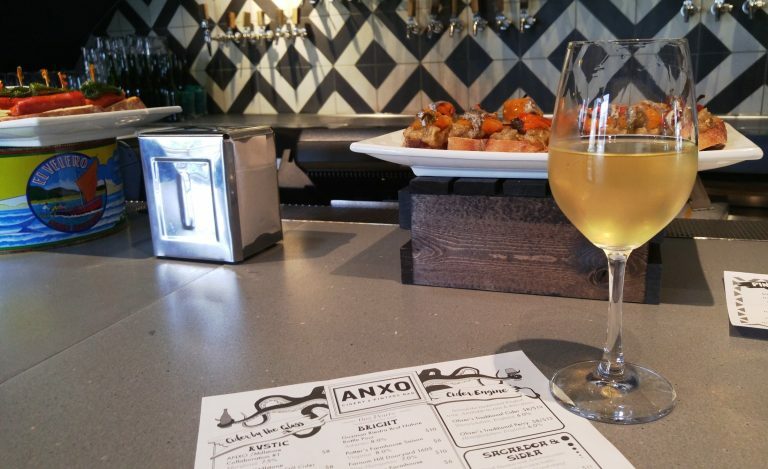 This is very much still phase 1 of the ANXO cider movement in the District, and early returns indicate that the city's ready for it, that the team here knows what they're doing, and that good things are up ahead. "We just want to make really good cider and see where it goes," says Prendergast. Does Britain's Campaign For Real Ale Have a Future?